Cardi B performs on stage at the 2019 Fanatics Super Bowl Party, Feb. 2, 2019, in Atlanta. Singer Miley Cyrus attends a red carpet gala event honoring Dolly Parton as the MusiCares person of the year, ahead of the Grammy Awards, in Los Angeles, Feb. 8, 2019. Willie Nelson and Brandi Carlile perform during a gala event honoring Dolly Parton as the MusiCares person of the year, ahead of the Grammy Awards, in Los Angeles, Feb. 8, 2019. 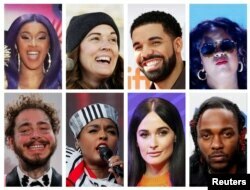 FILE - Grammy Award nominations in Album of the Year category includes artists in this combination photo; (Top L-R) Cardi B, Brandi Carlile, Drake and H.E.R., (Bottom L-R) Post Malone, Janelle Monae, Kacey Musgraves and Kendrick Lamar.